Cut off a salamander's tail and, in a few weeks, a near-perfect replacement grows. Do the same to a lizard and a new tail will regrow, but it won't be the same as the original. By comparing tail regeneration between the two animals, researchers at the University of Pittsburgh School of Medicine found that stem cells in the spinal cord are the ultimate limiting factor. 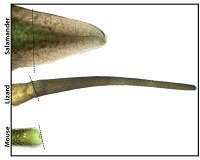 This finding, published this week in Proceedings of the National Academy of Sciences, answers the longstanding question of why tail regeneration is perfect in the salamander and imperfect in the lizard, and may serve as a stepping stone to understanding why mice can't regenerate their tails at all. 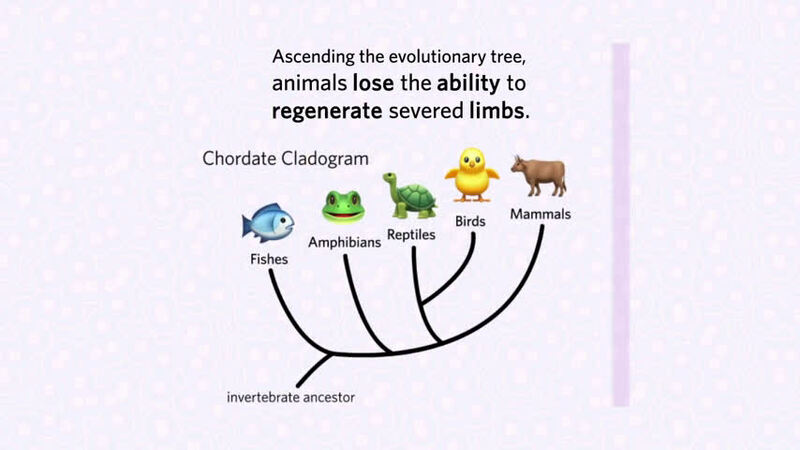 "The traditional animal model for regeneration is the salamander," said senior author Thomas P. Lozito, Ph.D., assistant professor in Pitt's Department of Orthopaedic Surgery, Center for Cellular and Molecular Engineering and the McGowan Institute for Regenerative Medicine. "Salamanders can regenerate a wide variety of tissues—brain, heart, parts of their eyes, limbs, tails—but they have whole classes of molecule types and tissues that just aren't found in mammals, so we really haven't been able to apply very much of what we found in the salamander to humans." According to Lozito, if the goal is to translate regeneration research to non-regenerating species like humans, the lizard is a much better model than the salamander. Lizards are the closest relative to mammals that can regenerate an appendage, and they have a similar genome and biochemistry. But lizards cannot regenerate lost limbs at all, and their regenerated tails are much simpler than the originals. "You can easily tell a lizard with a regenerated tail," Lozito said. "It doesn't get anything right. The scales are different; the color pattern is different, and then when you look inside the tail, all the tissues are different. There's no bone; the skeleton is completely cartilaginous, just tubes within tubes." Understanding what separates perfect regeneration in the salamander from imperfect regeneration in the lizard lays the groundwork for bridging the gap to non-regenerating species, Lozito said. Lozito's lizard of choice is the mourning gecko, which has several interesting properties, including a high tolerance for transplantation. This feature allowed his team to take neural stem cells—the nascent precursors of neurons and glia, the non-neuronal cells that surround them—from the salamander and insert them into the lizard's regenerating tail stump. The goal was to see what holds back tail regeneration in the lizard: the biochemical environment or the lizard's native stem cells. They found the transplanted salamander stem cells retained their ability to differentiate into multiple cell types, including neurons. By contrast, lizard neural stem cells could become only glial cells, which don't process the messages that direct movement and feeling. "It was a nice surprise," said lead author Aaron Sun, Ph.D., a Pitt physician-scientist trainee who completed part of his research in Lozito's lab. "And it goes to show that maybe the regenerative processes are still somewhat conserved." But perhaps the most surprising observation, according to Sun, is that the traditionally described "neural stem cells" driving regeneration in the lizard are not "true" neural stem cells at all. Although they check many of the classic boxes, they fall short of a defining characteristic—the ability to spring forth a diversity of cell types. That explains why there isn't perfect tail regeneration in the lizard, Lozito said. The neural stem cells can't produce the different cell types that would be needed to recreate the asymmetries of the original spinal cord, which in turn stymies the development of bony vertebrae. 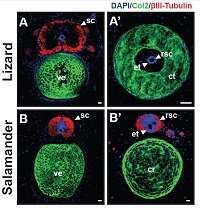 "The spinal cord is the master regulator of tail regeneration, and these differences that we're seeing between lizard and salamander tails are due to differences in stem cell quality," Lozito said. "It's all because of the neural stem cells." I read that a Geneticist spliced 'Hornless' Gene from a cattle breed into Different breed so that they too are born without horns. Cattle, Sheep, Pigs and Rabbits etc., are eaten. So, it may not be wise to mess up their Genomes. But, Rats, Donkeys, Dogs and Cats etc., are not eaten. So, it may be ESSENTIAL to make them permanently TAILLESS. Almost all of us do not have them, except 1 or 2 Humans in the world that are born with them. Pets wag tails and exacerbate their filth in the house. Once gone, we can spray antibiotics or put an expellable sticker!